As soon as the sun barely has risen, they take seat on the parquet made of gneiss. Scholars and Opera singers, Punks from Stadelhofen or Corine Mauch, car lovers or Jehova`s Witnesses: Tout Zurich has discovered the Sechseläutenplatz. Or has it? It was recently, the sun had just played up big time for the spring season premiere. One enjoyed overlooking the glistening surface of the lake to, after crossing the four-laned Utoquai just be, well, jolted right back into sanity. In front of a stone-desert. “Time does away with things cruelly!” the Neue Zürcher Zeitung (NZZ) lamented when mighty trees were felled in front of their mansion. That was 1905, when, for a singer`s festival, the two mighty trees, poplars, got chopped off in front of the adjacent old ‘Tonhalle’ (Zurich’s Concert Hall) . Soon the very same NZZ might lament again. Of all things, the red-green city government wants to fell further ancient trees. Why? “They`re ill”, claims the green council member Ruth Genner, or rather, “they are misplaced”. This time ‘they’ are those two city known mighty, thick-stemmed plane trees. They will be sawn off so that tramway passengers gain level access on all the thirty meters of the tram stop. “Wouldn`t a shorter level access suffice?” the Altstadt Kurier, Zurich`s district 1 Old Town Gazette asked back promptly. Have you noticed before you were reading “Two mighty poplars in front of the Tonhalle”, and not “The Opéra?”. That was not a mistake. Until 1896 the Tonhalle had been situated at Bellevue, thus the lake-adjacent premises until World War II were called “Alter Tonhalleplatz” (Old Concert Hall Square). Old postcards thus show how, in summer, in the heart of the city, spring wheat grew into the sky, rapeseed flourished, and potato sacks got filled. A Zurich poet thus wrote 1941 “(Here..) The city stands still, its noise smothered,as here, in silent sound, slightly lingering a plough is run through soil.” The heart of Zurich, occasionally, albeit determined by the conditions of war, appears fecund and beautiful. To the pyre with it! When a city evolves past the grips of a war, it changes, in the example of Zurich`s “Alter Tonhalleplatz”, names, even functions of its places. (With the WWII past and the Tonhalle moved away from Bellevue) the area now was called “Sechseläutenwiese” deducted from the tradition that a rather martialistic feast took place on the vast meadow. 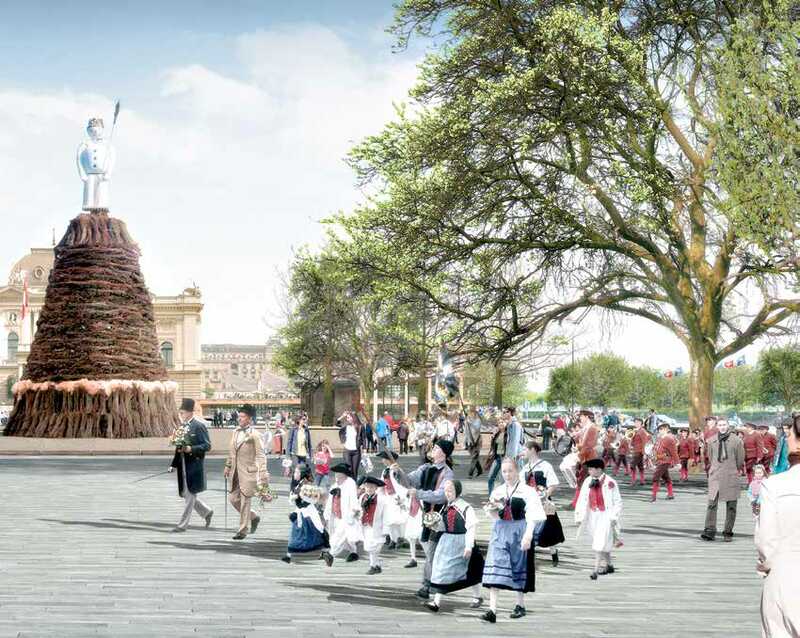 (german: Wiese) Already since 1903, traditionally set on the third Monday of April, the “Böögg” (a figure of a snowman with a firecracker-filled head) is installed on a pyre. Winter is literally burnt on a pyre. Members of local and regional guilds, all dressed up in traditional costumes from livery to garb form a colourful parade heading from the old town towards the Sechseläutenwiese. At 6 PM sharp (hence the traditions name, as the german “sechs” means six, and “läuten” means ringing of the bells) the pyre is ignited while guildsmen on one`s high horse parade around it. Sooner or later the “Böögg”‘s head catches fire and its head blasts. It`s a martialistic parade, perhaps graceful in its will to expel winter, and like any of all todays annual parades celebrated in Zurich, it has its own kind of “AfterHour”. This particular one invites people to grill sausages in the remaining embers. The Sechseläuten can be, one should smile inside, seen as the first Open Air Event of each year, including, as a mass event on green grass, the obligatoire tamped down fragile early spring grass. However, now that meadow has gone. Recently, it has been argued but nobody seems to know precisely whether Zurich`s government would like to do away with this event anyway. Why? Simply because its transported gender images, today, seem antagonistic. Or because the government does not seem to dare to do so just yet. Why? For a longer period, it was said the very same meadow was just ugly, a gross wasteland, a wartime field. That is why in 2012, the citizens nodded their “Yay” to a definitely not so cheap landscape project. Green light for a credit of 17,2 million Swiss Francs to transform this tundra and embellish it into a bounteous place of sheer worldliness. Computer graphics in the official polling gazette suggested a place lusciously framed by mighty tree crowns protecting guests in Boulevard cafés, rain or shine; while gently entwining the view from Bellevue near the bridge over to the building of the Opéra. With an additional water fountain coily competing with the one on Berne`s Bundesplatz, the place should, have its very own identity: it should be at least on 180 days be a place “for everyone”. On all other days it is reserved for social gatherings, or, pardon their anglicism, “Events” organized by the city: Sechseläuten, Streetparade, Züri Fäscht, the Circus. That`s how the Gazette writes it. Here we are now, and 4200 tons of stone weigh down the former swampland near the Lake of Zurich. This time around, the stones are a swiss produce – come to think of it, stones indeed do seem to be disposable in the Alps Republic – and not from Vietnam, as were those used to cobblestone-pave the adjacent Limmatquai. Which is called Limmatquai since 1933, as before it had the name Alpenquai. And yes, it has to be said, mostly the Sechseläutenwiese wasn`t a meadow, sometimes it was uncultivated land, other times a parking lot, and sometimes, well, sometimes a naturally frozen field of ice on which pirouettes were carved and pucks were hunted for. Last December, a skating rink could be found on this very same old now new place, too. The plasticy kind though, and in size smallish really, perhaps the size of those dogem bumper car platforms. And we stood there, our faces lit up in a pale blue-white neon light. The whole thing looked deserted. No one wanted to slip and slide on that “ice field”. Instead, bored faces stood in the cold while stemming their legs into their tummy, sipping “Glühwein” just to be sweeped off the square at 9 PM sharp. Preussian punctuality and order that is, even more so as it was styled down to the cups, which were not papercups but ceramic mugs handed out with a deposit, problably one of the legal requirements of the city. Us, though, we would have disposed of any cup in orderly fashion, even despite the slightly altered promille level. Near the “Ice field” stood these zwinglian norm-clones of cabins one knows from the main hall of Zurichs main station`s christmas market. Although tidier, way less esoteric kitsch, a whole lot less handicraft and nearly absent Svarovski, we asked ourselves, is this yet more… internationality? Hungry, we wanted sausages. What we found were… Thurgau sausages, pardon, Thuringian sausages! We speculated how they made their way to this tiny christmas market. So perhaps the mulled wine, known as “Glühwein” was of Zurich provenience? Usually brewed with white wine, which remained unbeknown to most guests, as they all drank a red wine mix. And since there was not one good old bratwurst, we moved on to the famous “Vorderer Sternen” right at Bellevue to bite into such a grilled good old “Saint Gall – bratwurst”. Since ages the Zurich city`s traffic undergoes renewal at large. 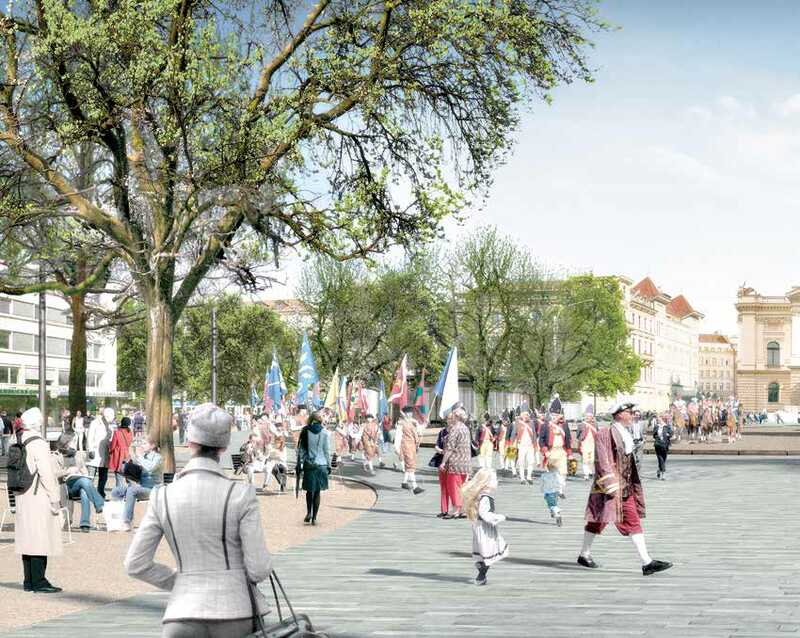 As a spatial experience with both tramcar and Utoquai`s convulsing avalanches of cars, the renewed Sechseläutenplatz feels like the largest traffic island afloat in ebbs and tides. A heart of stone. Hidden under its 110.000 slabs the new undergound parking Opéra hosts your car at pricey four Swiss Francs an hour, while watching gracefully streamlined limousines at the largest car exhibit “Automobilsalon” is still for free. Kept in minty colors, to some tastes it might feel fresh. To others, it might feel clinical. And when archeologists found pots and jars and instruments and old doors in rescue excavations they decided to place a part of the findings in a little exhibit down there. So now, when parking, one learns about the “neolithic pocket lighter”. A flintstone, clamped together with birchpice into a handle made of antlers was used to beat a piece of pyrite until the generated sparks ignited tinder. Tinder burns easily. Stone age people used the knocked flat tinder fungus, a fungus which grows from barks like little roofs. And yet these archeological findings have not found their way up. Our ancestors on “Kleiner Hafner”, as Sechseläutenplatz once was called also, were neolithics, in fact, they were pile dwellers. Various info shields explain that they have eaten wheat, barley, poppy seeds, beef, sheep, goat and pigs. At this very lake. Living in cabins on piles of wood above water. One might ask: has no delicious Egli fish or whitefish ever lost its way between the teeth of these early residents of the zurich lake shore? Who knows. And we, we will now sit on one of these exactly 100 chairs, the same chairs as in the Jardin de Luxembourg in Paris, under one of the provisionally naked tulip trees. Should we find a free one, that is. Currently, 4000 people are arguing about one of these metal objects. Perhaps a chair for everyone might be the case in the year 2082 or between the early hours of 5 and 6, or “in the hour of the idiot” as they say in Zurichs Langstrasse district. The new Sechseläutenplatz is quite often compared with St. Mark`s Square in Venice. That may be right in respect of its size, but it misses these various orchestras fiddling away their versions of Vivaldi`s “The Four Seasons” while one sips a highly overpriced 10 Euro “caffè”(albeit a very tasty spruzzatto di caffè as I recall it) in the legendary Caffè Florian. It also misses the ever present pigeons, the carillons, an opulent basilica, a Campanile and the ever so present T-Shirt sellers. That, and the high floods and the stolen holy figures of the city. And the exit signs one finds once leaving: “Ferrovia.”(which sounds like the yelling of the remaining 50-somewhat thousand real Venetians: Vai Via!) In other words, what the Sechseläutenplatz misses is a real charme offense. One speculates how it is going to feel once a good summer sun boils the 15`000 square meters of stone? Who would want to press his four letters on Zurichs largest heating plate? And the Sechseläuten itself, how is that going to pass? The spreading of many tons of quartz sand are needed annnually to carry out that specific event, allowing the parading horses a graceful time. The “Böögg`s” big bang will take place each year. One thing is for sure. This place will look pretty darn sad and dark during its nationwide broadcast. For the most part, it`s a cleaned up event which now isn`t only overpriced and democratically discussed, but also takes place on Zurich`s newest Heart Of Stone. This entry was posted on April 30, 2014 by Patrick Neithard in Uncategorized and tagged Living in Zurich, Place Identity, Sechseläutenplatz Zürich.